Fly-tippers have broken into a business property and dumped a "mountain" of rubbish. 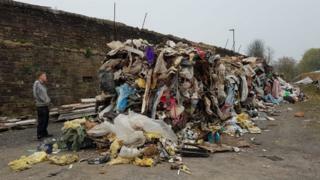 It said it had been quoted between £3,000 and £5,000 to have the waste - which includes mattresses - removed. The firm said Blackburn with Darwen Council told it the matter would have to be referred to the Environment Agency because of the scale of it. The incident is also being investigated by Lancashire Police. Scott Cooper, the company's managing director, described the waste as "disgusting". He added: "It could have asbestos or hypodermic needles in it, and we can even see petrol cans." Louise McGaffigan, who also works for the firm, said: "I was shown a photograph of it first and thought it was a wind up. When I actually saw it, it was colossal. "It is like a mountain, with mattresses and prams amongst it and it absolutely hums." Fly-tipping: What can you do with rubbish dumped on your land?